"8-bit", a fun loving alien, is just trying to have a good time bouncing around while some mean, nasty aliens try and get in his way. Help 8-bit get past any obstacles that get in his way. Bouncy Shoes the Game is done! That quote basically sums up my feelings about my game. I wish my game was better, but it is what it is. It is only one level, but it is a complete game with sound effects, music, a title screen and workable mechanics. I learned a lot during this week but I still have a lot to learn about game development. There was plenty of stuff I wanted to experiment with or play around with that I just didn't have the time for. I'm also not convinced that the core mechanic of "bouncing" was a good choice for a side scroller. Overall, at least it works fairly well. Making a game in one week was tough. I've never worked harder on a programming project before. While I can't wait to go back to my usual game development pace, I found this challenge very rewarding. Basically today's goal to create a minimally viable game out of what I had so far. My ambitions for an interesting camera, and other fancy things I had to give up. At the moment, you can actually play the game from beginning to end. There is next to no polish for the title screen and other transition scenes. Oh well. Basically all I have time for tomorrow before the deadline is to maybe choose a better font for the title screen, and add some basic music and sound effects. Maybe the game won't be super awesome, but at least it'll be done. That's something I guess. Today was a bit of a write off. Not much actual progress and I still haven't finished the first level. Oh well. At least the camera is now a little more interesting. It occured to me that since the camera is at its core just a pygame rect, I could apply things like acceleration and velocity to it. It's a bit buggy right now, but I'll fix it tomorrow. I think I can say that all the basic game mechanics are done. Today I added a death animation for enemies killed during bouncy mode. One fun thing I added was that instead of the enemy just disappearing from the level, their dead carcass is left on the ground. It's a simple effect, but adds a lot to the game. If you haven't seen this talk on "Screen shake" and other things you can do to make a game better, you should because it's great. It's where I learned about this idea of permanence. Another interesting, but minor effect is that dead enemies are randomly placed into a group that is either in front of or behind the player. This gives a little depth to an otherwise 2D world. Again it emphasizes the permanence of the player's impact on the world. The player is also damaged if he touches an enemy when not in bouncy mode. I added a little red tint effect when he bounces back to emphasize the damage. I have to add in the concept of player health (and potential death), but that is for another day. Goals for tomorrow: Time to create an actual level. After that, I need to do all the no-fun little things you have to do to make a complete game: title screen, player health, score, sound effects, etc. If I have time after finishing these boring but important things, I'll add more levels. Today was a pretty productive day. The player can now enter "bouncy mode" when he touches a star. This means the player continuously bounces for 10 seconds after collecting a bouncy star. Collisions with powerup stars use rectangle collisions initially, and then mask collisions for accuracy. It was surprisingly simple to implement. There is also now a green tinting effect when in bouncy mode. With some sound effects it'll be pretty cool. I also made an enemy character. Basically he just walks back and forth, nothing too special. 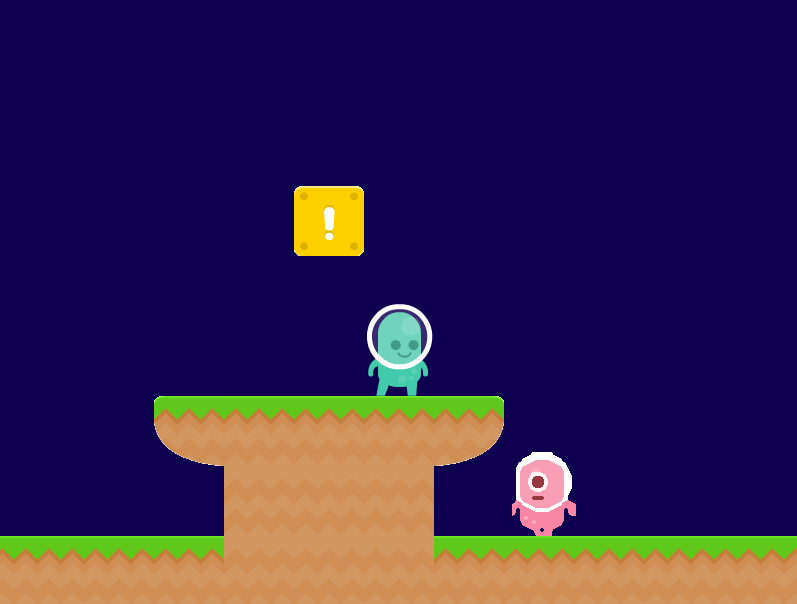 Goals for tomorrow: Implement the ability for the player to kill enemies while in bouncy mode. I want to create a sense of permanence by having the enemies' dead bodies left in the level on the ground. We'll see how it looks. I know I say this everyday, but I really want to get the mechanics down pretty solidly before really working on level design. Hopefully, tomorow I'll be done the mechanics. I also want to spend some time experimenting with the camera, maybe adding a delay instead of always being centred on the character. Game is coming along fairly well. At this point, running, walking and jumping are all working well. The character's animations look nice. 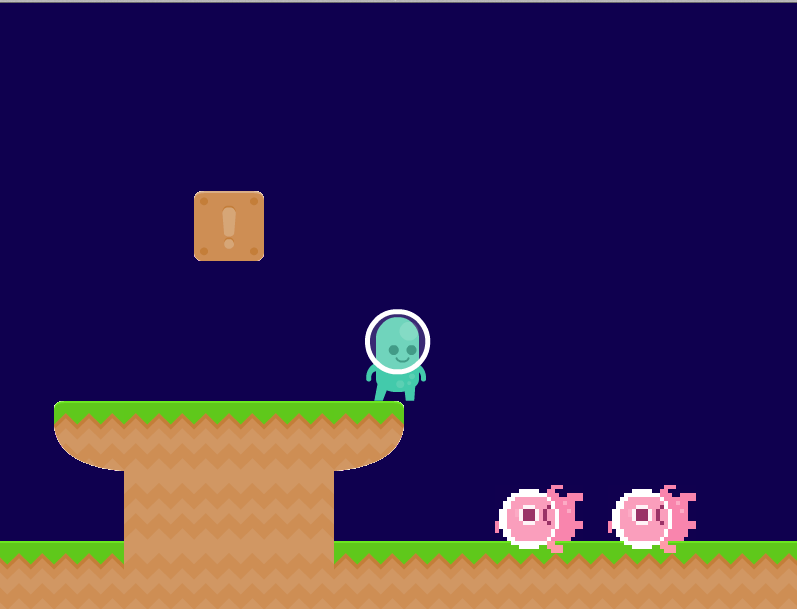 I still need to add the "bouncing" mode where the player is in a continuous bouncy state for a period of time. I think I'll make it so that the character will be invincible while in the bouncing state. He will only be able to kill enemies when bouncing, otherwise he will get hurt. Item boxes are finished, with animations and everything. At this point a "Bouncy Star" power up appears when the box is bumped, but it doesn't do anything yet. 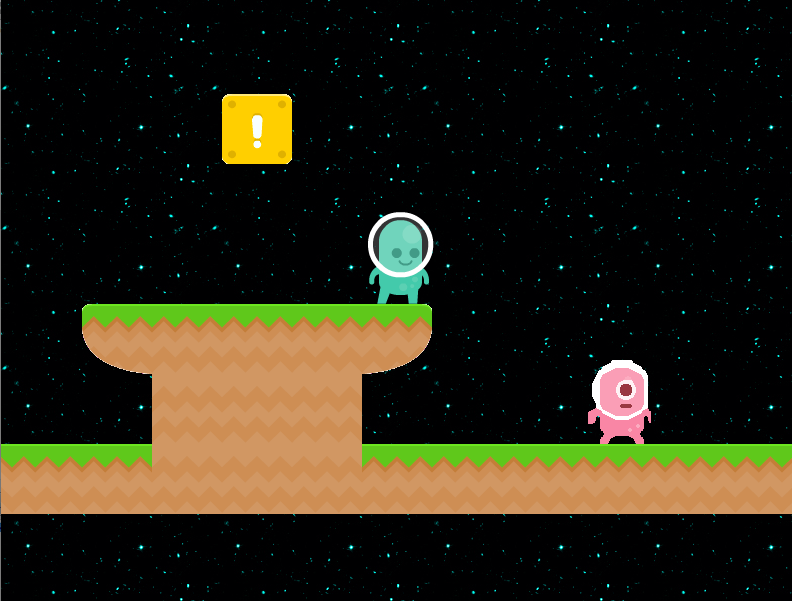 Tomorrow's Goals: Finish the bouncy star's animation, add the bouncing mode and begin crafting the level. For my platformer, I decided to use Kenney's free sprite sheets. I think for my enemies I will use 8-bit sprites to keep with the theme of the challenge. At the moment, I have sprite sheet loading working, as well as basic acceleration and deceleration of the character. I'm using the formula x_vel += (MAX_SPEED - x_vel) * .1 for acceleration and deceleration. It looks pretty nice for only a little math. A lot better than just linear motion. Goals for tomorrow: Finish all the player mechanics, including the bouncing mechanic that the game will be focusing on. Maybe begin to flesh out the level and add enemies. 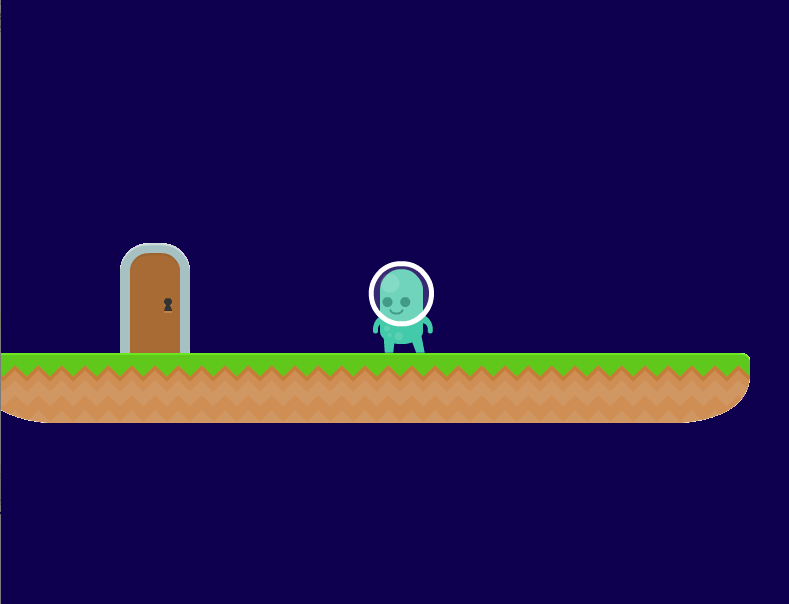 I decided my game is going to be a sidescroller. Since I've already made one before, at least I'm more likely to actually finish the game in a week. 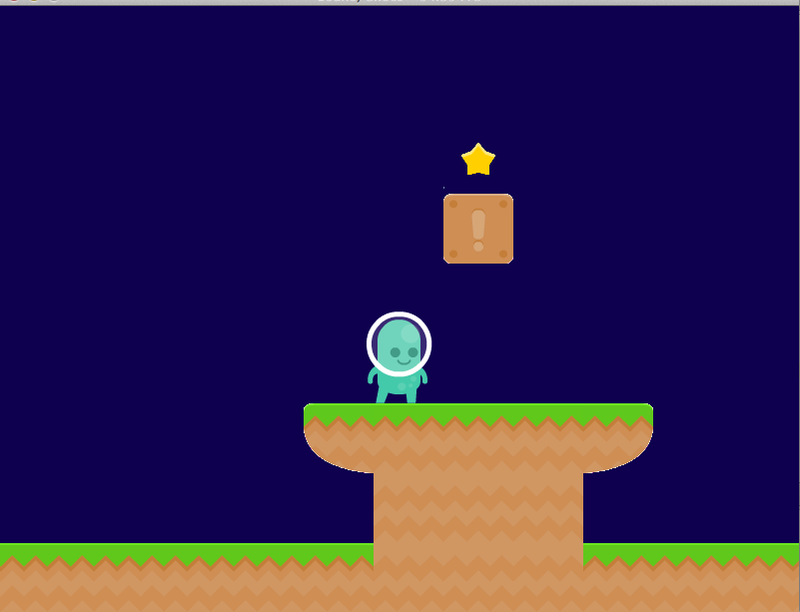 The basic mechanics will be a normal Mario-esque side scroller, with a powerup that makes the player bounce continously. I want a feature where if the player hits jump within a window, the player will jump really high. Ideally I want multiple levels exploring this concept, but just one will be okay too. I think I'll name the game Bouncy Shoes. I still have to figure out how to incorporate the theme into the game. Basically tonight all I got done was the basic boilerplate code to support scene switching and resource loading. Hopefully tomorrow I'll actually get some really game content done.